Earlier this year, an interesting and highly entertaining video was published on You Tube which proved beyond doubt that even within the the animal world, unequal pay is a controversial issue. In this blog post, we thought we’d share the video with you and at the same time give you some great English idioms for expressing anger, which, as you will see, is exactly what one of the monkeys does in the ‘must see’ videos below. This video, which has to date received in excess of 14.5 million video views, reveals the findings of a ‘fairness study’ conducted by a respected US university professor and primatologist, Frans de Waal. 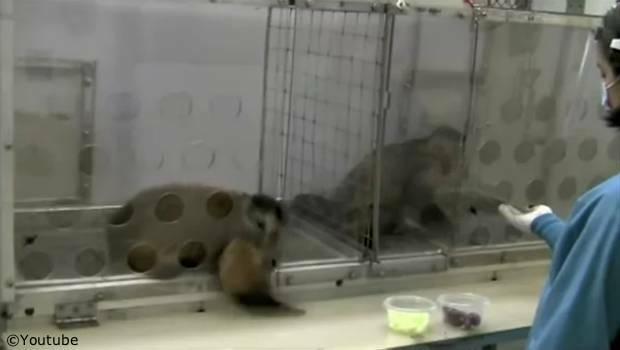 The experiment, first carried out with Capuchin monkeys nearly ten years ago, was performed again and filmed not long after Frans de Waal witnessed the Occupy Wall Street protests last year and was reminded how the moral outrage expressed by humans over economic inequity was very similar to that expressed by monkeys and chimps during his experiments. 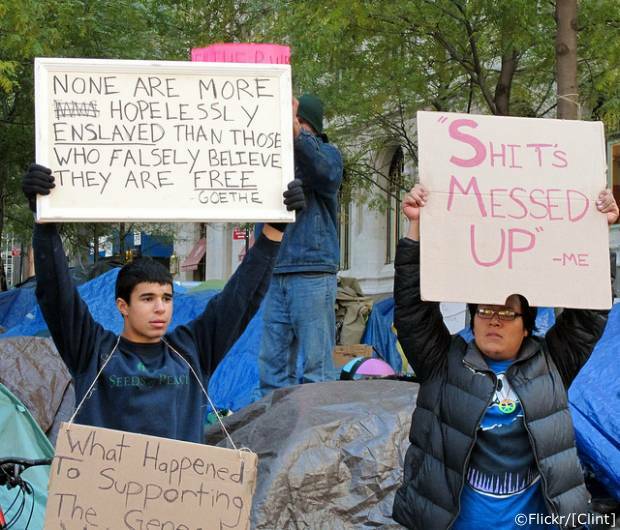 Occupy Wall Street protests – the protesters are up in arms! 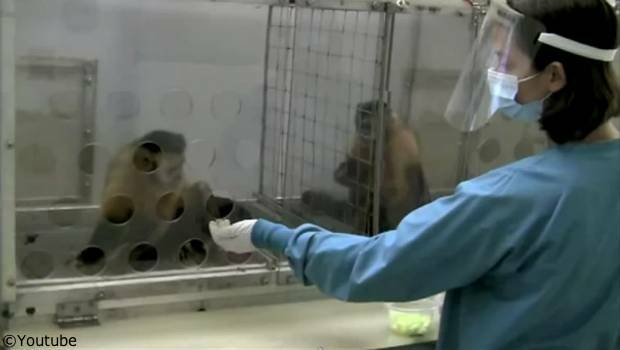 In the experiment, the two Capuchin monkeys have to give their human handlers a small rock in exchange for an edible treat. To start with, both monkeys are given pieces of cucumber which they are initially happy to exchange for the small rock. Getting hot under the collar! However, when one monkey is given a nice tasty grape – clearly good currency within the Capuchin monkey kingdom – instead of the cucumber, the other monkey believes that it will be rewarded in the same way. The monkey is sadly mistaken, though, and gets very hot under the collar when, after passing over its rock, it does not receive the anticipated grape, but instead is given just another boring chunk of cucumber. The monkey blows a fuse! 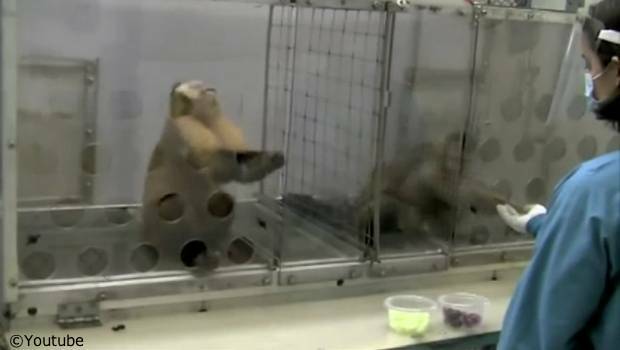 The monkey blows a fuse and expresses its great displeasure by launching a rock at the lab assistant, pounding its hands on the table through the bars of the cage and jumping around the walls of its enclosure in bitter protest at the great injustice of the situation. The experiment has since been carried out with birds, dogs and chimpanzees, with similar findings. In fact, proof that a sense of fairness is not unique to humans was further enhanced where the study showed that some chimpanzees actually refused to accept the grapes unless their mate was rewarded in the same way. The video is clearly highly amusing to all who watch it, but the serious point to remember is that the inequity created in this experiment causes stress and tension for both parties (just as it does for humans). Not only is the monkey that doesn’t get the grape upset but the one that does has to cope with the resulting anger. The overall conclusion of the experiments is that a sense of fairness and outrage over moral equality are by no means behaviours unique to the human race. In the text above, we referred to the Capuchin monkey on the left as ‘going bananas’, ‘blowing a fuse’ and getting ‘hot under the colar’. These are all English idioms which express anger. We could have used any of the following idioms which we’ve grouped together here as they pretty much mean the same; they all express anger or annoyance in one form or another. I don’t know what you’re getting so steamed up about, it’s me that’s been sentenced to life in prison, not you! The CEO got really hot under the collar when I told him that I’d fired his wife. If I don’t pass my English exam this time, my dad’s going to go bananas again! My girlfriend went ballistic when i told her that I’d been for a drink with my ex-wife. My mum was hopping mad when I told her that I’d refused the once in a lifetime offer to study Chinese in Hong Kong for for free. I’m going to do my nut if you turn the TV channel over again without asking me first. Jack saw red when I told him I’d crashed his car. I don’t know why you are getting so worked up, just because I was an hour late and we missed the concert, doesn’t mean it’s the end of the world! Hong Kong students were up in arms about the government’s proposed patriotic education lessons. Why do you always get so arsey when I look at other women? My husband blew a gasket when I told him I’d been seeing his brother behind his back for 3 years. Oh no, Simon’s throwing a wobbler again because I won’t let him have his sweets until he’s eaten his dinner. My teacher hit the rood when i told him I’d not done my homework. I think Dave must be really stressed at the moment; he’s always flying of the handle these days for no apparent reason. to be on the warpath – to be looking for someone you are angry with in order to speak angrily to them or punish them. Oh no, I’ve just heard that the boss in on the war path again because she’s just found out that I’ve lost yet another contract. to rant and rave – to argue loudly and energetically. What was all that ranting and raving coming from your bedroom last night. I just don’t know why you two can’t learn to live together. bear with sore head – If someone is behaving like a bear with a sore head, they are very irritable and bad-tempered. My wife’s been like a bear with a sore head recently. I told her I was sorry about forgetting our anniversary but she just doesn’t seem to be able to get over it. to be the end of one’s rope/tether – one cannot be patient any longer; one is about to become very angry. The poor woman has been looking after those screaming kids for 6 hours now. She must be at the very end of her tether. to drive someone up the wall/round the bend/round the twist – to make someone annoyed or angry, especially by continuing to do something annoying. I wish the plumber would stop that stupid whistling, he’s driving me up the wall! give/shoot somebody a dirty look – to look at someone in a way thats shows you are angry or upset. Wow! Did you see that dirty look he gave her? I wonder what she said to him. If there are any expressions we’ve left out, please share them in the comment box below. And why not try writing your own sentence using one of the idioms above? Can I say ” I flipped my lid when I saw those poor monkeys” ? Good one, Baza! Yes, indeed, you can say that. The monkey went bonkers because he only got cucumber. Right? I heard my boss say “Our rivals must be seething” Is this common language for ‘angry’ too?